The US is publishing ADP Employment Change and ADP Employment Change along with the Eurozone releasing GDP Growth Rate QoQ Final and GDP Growth Rate YoY Final. 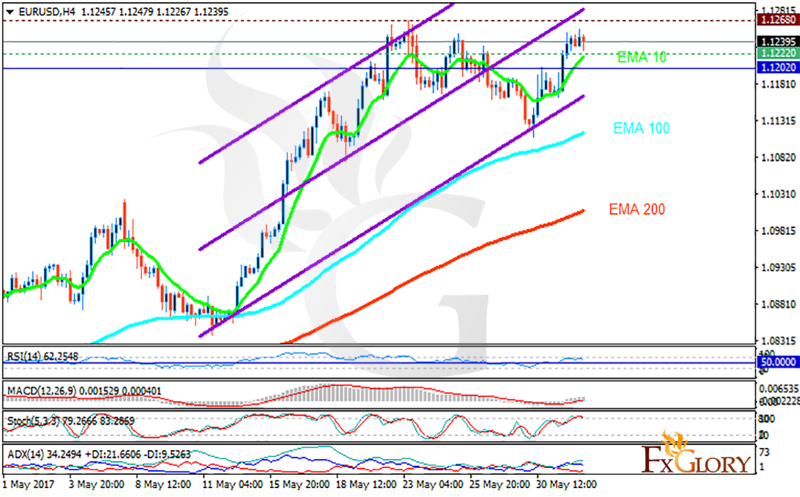 The support rests at 1.12220 with resistance at 1.12680 which both lines are above the weekly pivot point at 1.12020. The EMA of 10 is moving with bullish bias along the ascendant channel and it is above the EMA of 100 and the EMA of 200. The RSI is falling towards the 50 level, the Stochastic is showing downward momentum and the MACD indicator is in positive territory. The ADX is showing buy signals. The resistance area seems to be too strong to be broken therefore short positions are recommended targeting 1.100.